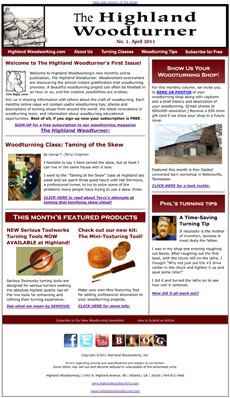 We’ve been cooking up something good in the back offices of Highland Woodworking, and now it is ready for you to see: our new WOODTURNING-SPECIFIC newsletter, The Highland Woodturner! This will be a monthly publication devoted to all things woodturning, including useful tips, woodturning-specific shops, the latest woodturning tools and more! This month we feature Ken Gaidos’ beautiful converted barn turning shop, as well as a time-saving turning tip from Highland Woodworking’s own Phil Colson and an entertaining review of Highland Woodworking’s skew chisel class by Highland blogger Terry Chapman. Featured tools this month include the new top-of-the-line Serious Woodworks turning tools and a mini texturing tool kit that will help you add professional decoration to your turning projects. Take a look inside here. And if you would like to subscribe to receive it monthly, sign up here! The Plane Facts: What’s So Special About This Ductile Cast Iron? Leigh Dovetail Jigs: A Great Deal is Almost Gone!